DAY 23: THE CHILDREN WHO ARE “OLDER” THAN THEIR PARENTS. While surfing the web one day like that, I stumbled on a video of a little girl called Adalia Rose. What caught my attention was Adalia’s physical appearance. Initially, I wasn’t quite sure whether what I was looking at was human or extra-terrestrial. I found it cute though watching several videos of this peculiar looking child having fun, dancing, singing and excitedly chatting away. I still couldn’t figure out what could have been responsible for her odd look. I was quite confused really. In addition to her unique facies and aged appearance, she has a large bald head, a tiny body, and a very nasal voice. I couldn’t possibly imagine what was responsible for all these. As they say Google is your friend so I put it to use and found some interesting things. It turns out Adalia was born with a very rare disease, called Hutchinson-Gilford progeria syndrome (progeria for short). 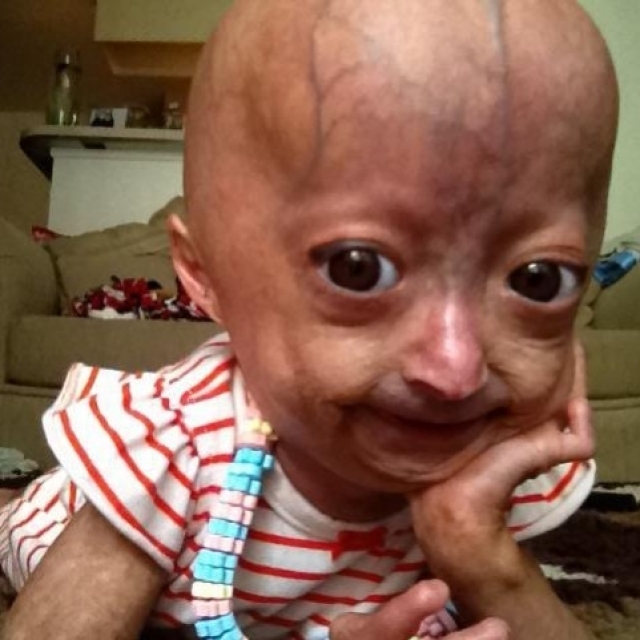 Even with her disease, Adalia is such a beautiful, sweet child. I think she’s pretty sharp for her age too. A victim of constant cyber-bullying, Adalia has continued to enjoy her life and raise awareness about her condition. She’s quite the little starlet too, just check out her Videos on YouTube. Asides Adalia, Hayley Okines is another famous child living with HGP syndrome. She has co-written and published her autobiography titled “Old Before My Time ” in addition to raising funds for research and awareness about her condition. She alongside Sam Berns have lived past the usual life expectancy for children with thier condtion, which is 13 years. At age 14, Hayley had the body of a 105 year old woman and is among 89 children in 32 countries living with progeria. These children are true gladiators! i trully respect them. Click here for more info on Progeria. This entry was posted in 30 days Challenge., Non-Fiction and tagged Adalia Rose, Hayley Okines, Health, Progeria, Sam Berns by j3mstone. Bookmark the permalink.